It’s impossible to truly recreate southern food here cuz we just do not have access to the same ingredients that they do in Louisiana. You can bring in all the signifiers, like jazz music, jazz posters, trinkets and memorabilia, but what really counts is the flavour of the food. The menu. 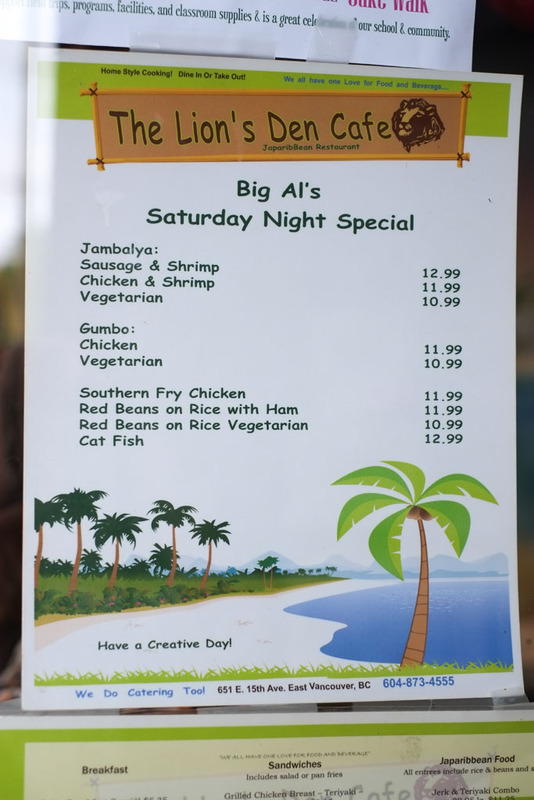 Check out The Lion’s Den Facebook page for details on when Big Al’s doing his next “pop-up”. Side note: this is a pop-up in every sense, but without any shred of hipsterdom attached to it. It’s just people getting together to serve up delicious food that they believe in, regardless of trends, fashion, and what’s “hot” in the Vancouver scene. 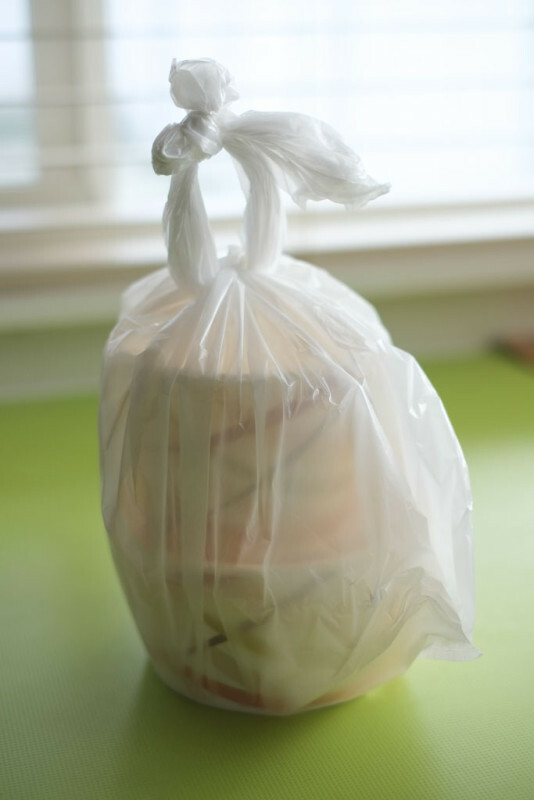 I think it must be Junko’s Japanese influence on how they tie the bags for takeout. It’s this intricate yet easy to untie multi-loop thing that creates a handle yet keeps food in place. It’s like how they put a little ice pack in with your sushi to keep it cold if you buy sushi from a depachika (Japanese basement department store supermarkets). It shows thought and consideration, from a customer’s point of view. Each entrée came with cornbread. 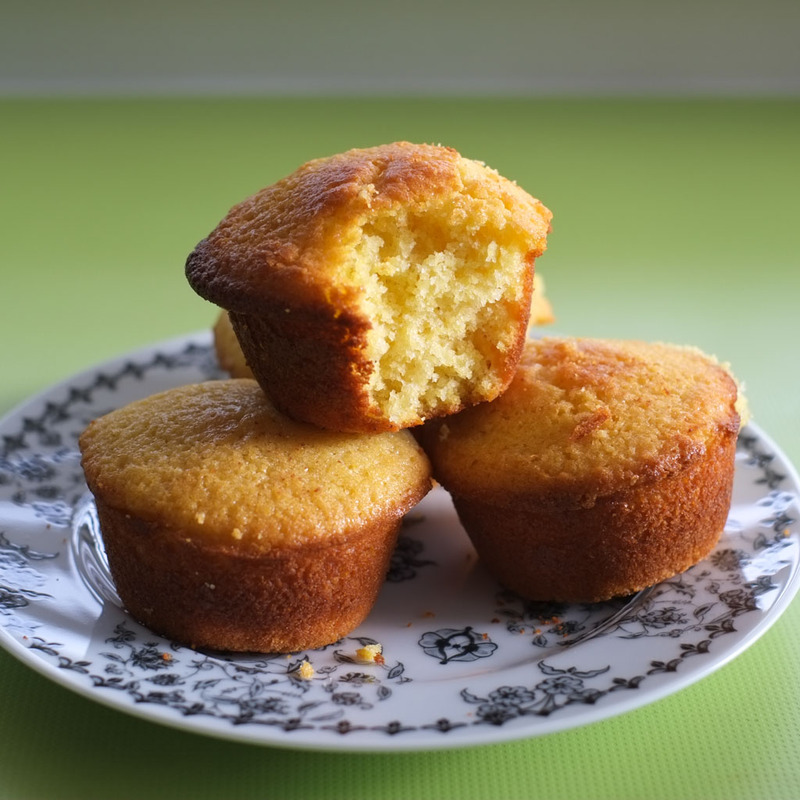 There are huge debates about whether cornbread should have sugar in it or not. Along with American BBQ, Southern food is probably one of the most argued-about types of food, with regards to style, authenticity, and the proper methods of preparation. This Serious Eats article, The Real Reason Sugar Has No Place in Cornbread, talks specifically about cornbread and is well worth reading if you have any interest in contentious food topics. 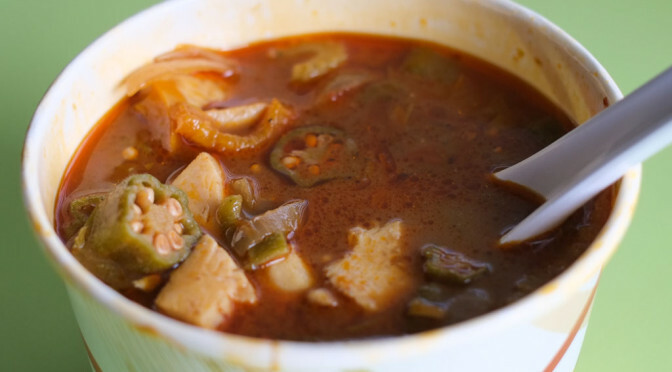 I think that anyone from the South or living in the South or is a fan of Southern cooking would have plenty to nitpick about the food in this post. But I can only speak to the flavours I got and whether I enjoyed it. I would love to meet up with you over a beer and have a friendly debate about food and authenticity. Anyways, Big Al’s cornbread is sweet but acceptably so, and I think the sugar helps create those delicious crunchy parts along the sides and crown. The inside was moist, yielding, crumbly, light, and very delicious — especially with some softened butter slathered on it. 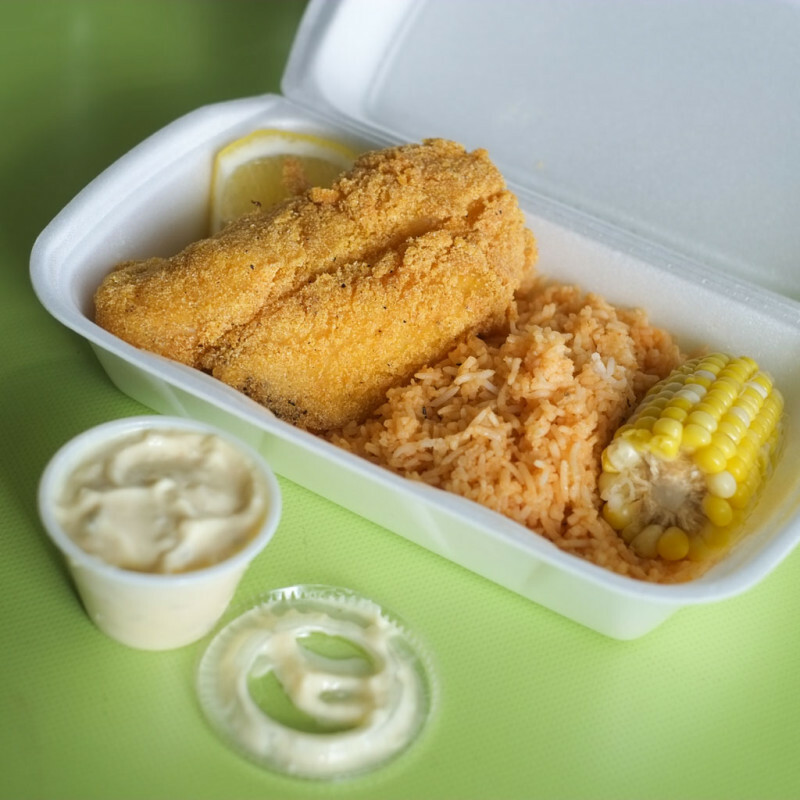 Cornmeal-crusted Catfish served with rice, corn, and tartar sauce. 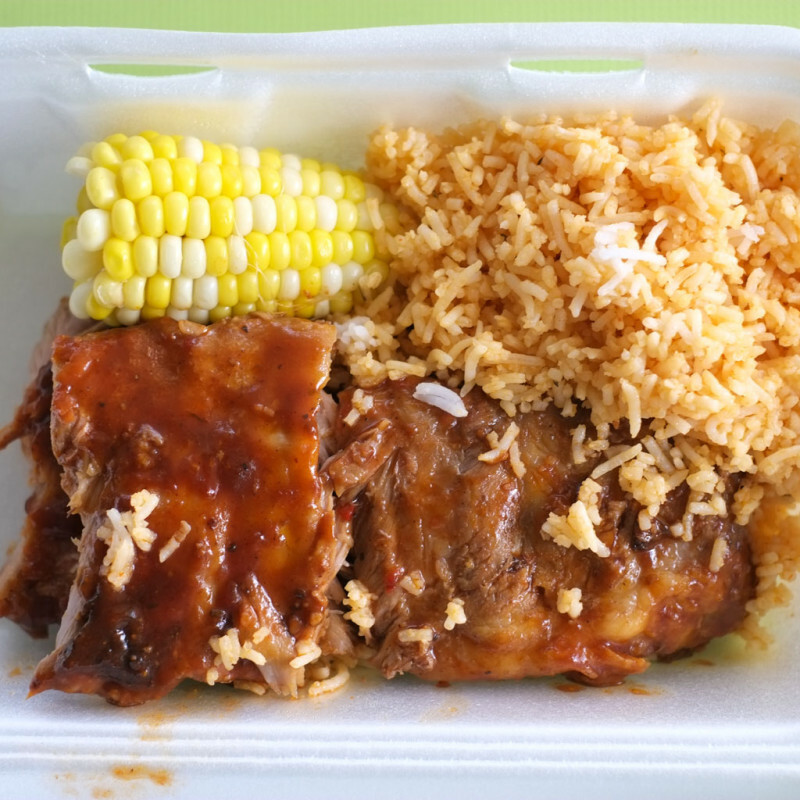 The rice (same rice that’s served with the ribs, below) has a tangy (tomatoey?) flavour that plays well with the fish. The last time I had catfish was probably at a Vietnamese restaurant in LA a few years ago*. It was mushy, muddy and mealy. Not good. 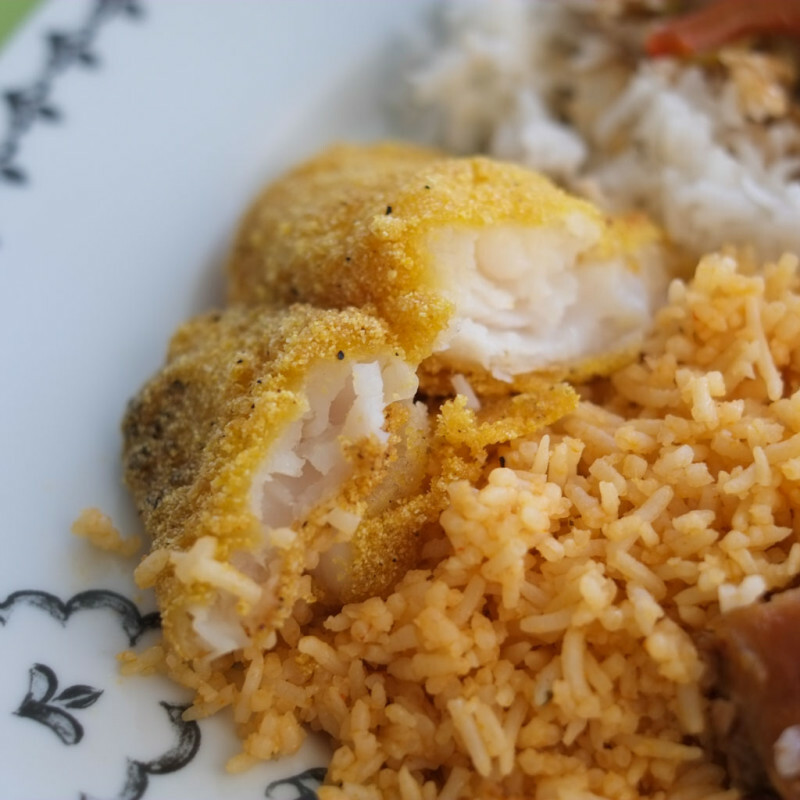 This catfish was different — much cleaner, lighter, delicate, and flaky. The lightly-seasoned crispy/crunchy cornmeal coating was almost too thick for the delicate fish, but worked well enough to be very enjoyable. Squeeze of lemon and a dab of tartar sauce and you’re in catfish heaven. I could inhale another order of this. Note: I suspect that this was made from frozen catfish fillets that had been salted because the flesh had this mild saltiness running through it. Wicca wasn’t a fan but I thought it was acceptable. The catfish available here isn’t really suited for delicate preparations, and takes better to recipes like Vietnamese Ca Kho To (Caramelized Claypot Fish) where you’re throwing tons of seasoning on it to mask the muddiness. * Nope, it was actually last summer at Cuu Long. 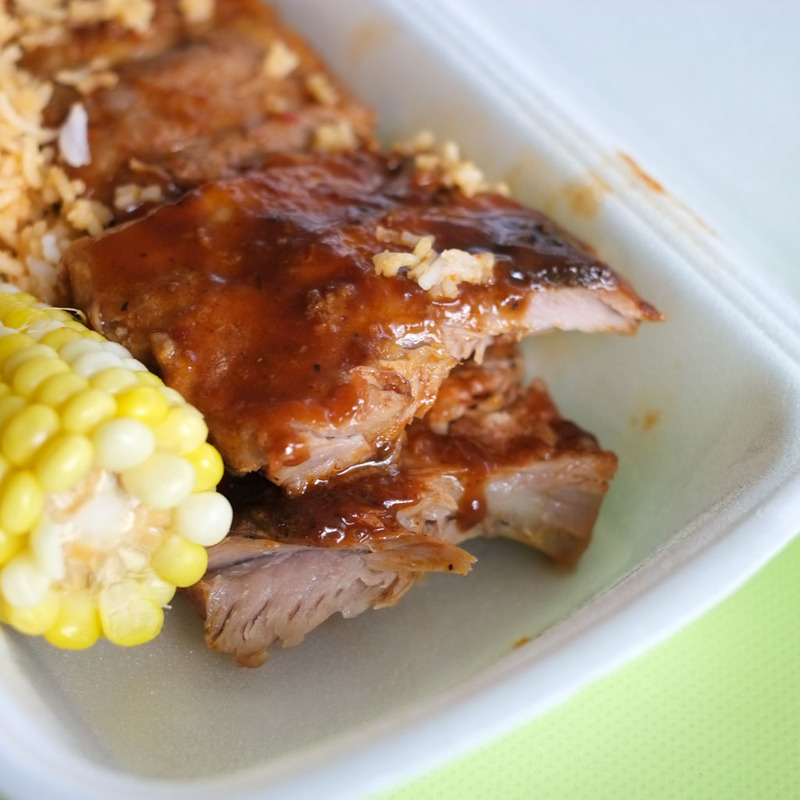 Off-menu BBQ Ribs. Another contentious dish. These haven’t touched a smoker but were still ok, depending on how picky you are about bbq ribs. The sauce was nicely balanced. Not too sweet or syrupy. If you like your ribs ultra-tender, you’ll like these. But it’s obvious where these ribs stand in the pantheon of bbq rib possibilities. Offensive to bbq purists but acceptable to everyone else. 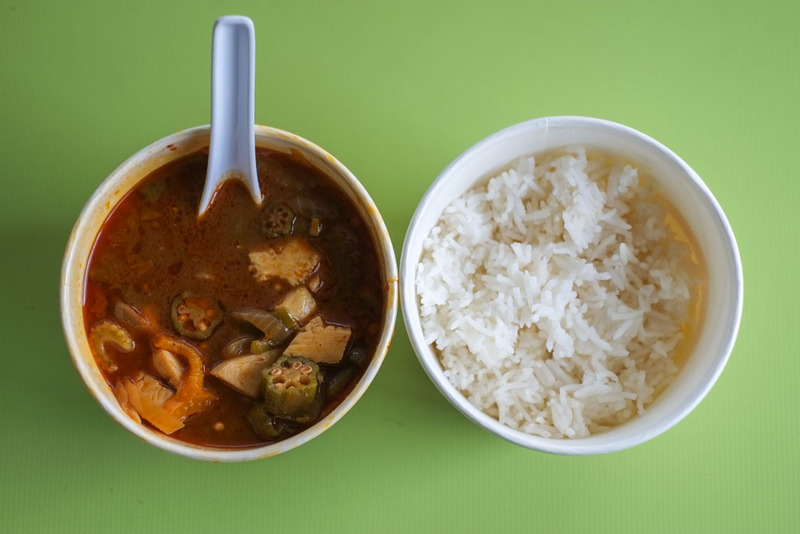 Chicken Gumbo with okra and served with rice. This was probably my second experience with gumbo and I doubt my first experience was authentic or even good. 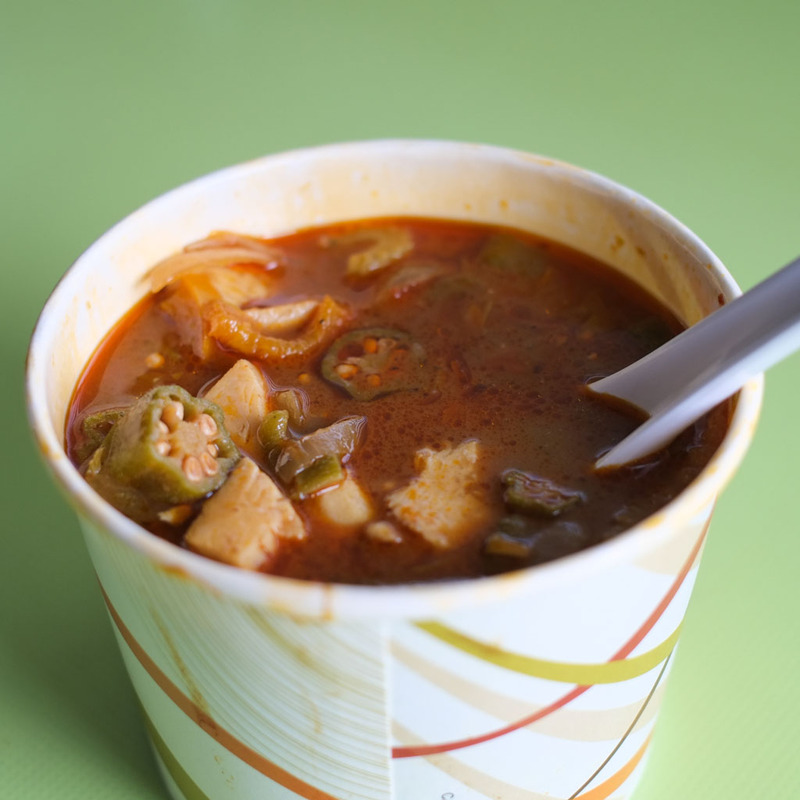 This gumbo had a mild yet deep flavour with a pronounced sour kick, sort of like those vinegar-based Louisiana hot sauces. Spicy, tomatoey, a bit smoky, and had a slight thickness to it, maybe from the okra. Whitemeat chicken pieces. Really hard to pinpoint specific flavours other than the pronounced sour quality. It all combines into this subtle yet complex flavour that was new to me. It felt like Big Al has this experienced, assured hand in the kitchen, and that he’d cook this the exact same way every time. I know what you’re thinking…”That ain’t no Jambalaya! It should be thicker and have rice!” Well, take it to the man. Jambalaya with sausage and shrimp. 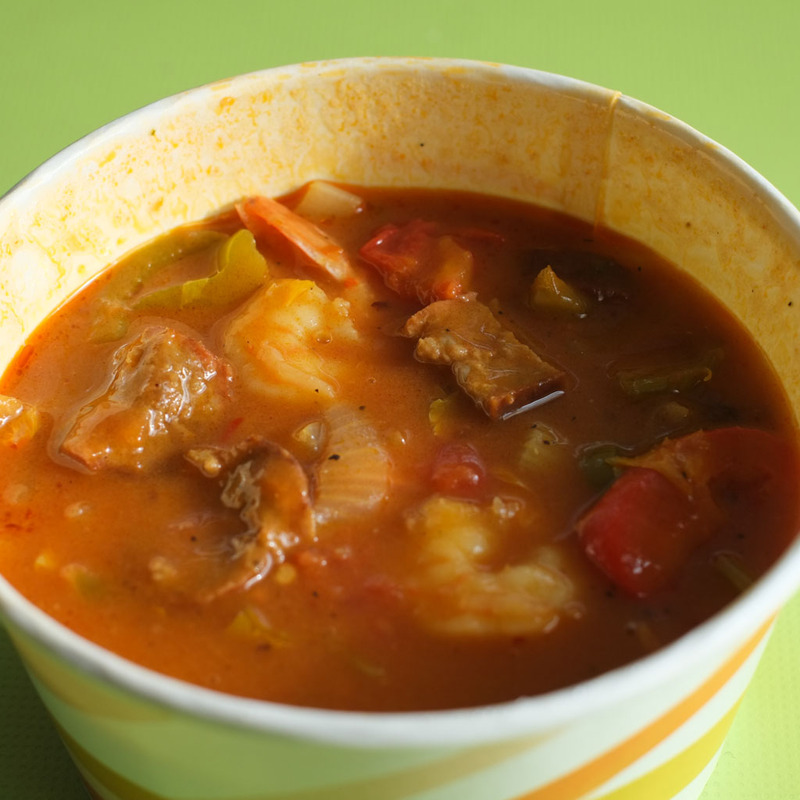 Fresh-tasting, perfectly cooked shrimp in another tomatoey stew-like concoction. Rice was served on the side, rather than incorporated into the dish. Wicca liked this more than the gumbo. Another mild, subtle yet deep and complex dish. I’ll be thinking about this dish for a while, trying to unravel what jambalaya means. Can a Chinese-Canadian guy eating Southern American food truly understand what Southern food means? We were very happy the food. The theme for the whole meal was mild yet deep, subtle yet complex. Soul-satisfying yet leaving you hungry for more. I thought the food would be a lot heavier than it actually was. I really felt lifted. Previous PostTakeout Quickie: Soulful Jamaican Eats at The Lion’s Den CafeNext PostNeedlessly large American diner pancakes at Jethro’s Fine Grub on Fraser St. Wait.. You ordered gumbo and jambalaya? Bit of a correction. The link you have to Lion’s Den Cafe is to a different place with the same name. I don’t think Lion’s Den in Vancouver has a web page. Thanks! Updated to their Facebook page.